Join a remarkable primate as he bestows prizes upon lucky players in Monkey Prince slot machine by IGT. This stunning new release has 5-reels and 60-lines where the Monkey guides you through the action. Win extra rewards with features that include a Mask Collection feature with three different wild features, normal wilds, and a free spins bonus. 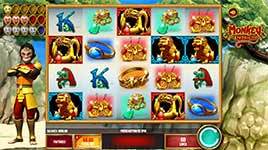 Wilds – The wild symbol substitutes for all symbols except the masks and free spins trigger to complete wins when possible. Mask Collection – Collect three different masks to trigger three different features. Collect 5 blue masks and randomly turn 3 or 4 symbols Wild for the current spin. Collect 5 red masks and randomly turn 1 to 5 reels entirely wild for the current spin. Collect 5 gold masks and randomly turn 1 symbol into a Surrounding Wild for the current spin. Free Spins Bonus – The Red doors is the free spins trigger and landing three or more will win you this feature. 3, 4 or 5 doors will earn you anywhere from 5-25, 10-30 or 15-50 free spins respectively with one of the three mask features active!